Working nine to five is a real killer, but teambuilding holidays can sometimes be even worse. A coach lurches out of the hustle and bustle of Budapest and heads towards the mountainous border. Aboard are seven employees of the international weapons manufacturer Palisade Defence, global suppliers of innovative weaponry for the past 75 war-torn years. The lucky group are being treated to a team-building weekend at the company’s newly built luxury spa lodge by their president, George Cinders. But things quickly go awry as the colleagues find themselves faced with the chop when their corporate weekend is sabotaged by a deadly enemy. 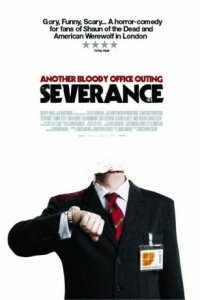 Forget office politics, only the smartest will survive this bloody office outing. Baz is one of Britain's new breed of police, a cycle cop. Although he appears to be a figure of fun, a freak accident turns him into a psychopath. Instead of the title Piranha 3D Part 2, we get Piranha 3DD - as in Double D bra size. There's something in the water.